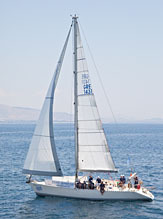 Dromor 48 was designed by the Greek naval architect Triantafillopoulos in order to tame the difficult Aegean waves. The yacht was totally refited in 2013 and has nothing to envy in matters of comfort from yachts of recent construction. MAJOR EQUIPMENT: Electric anchor winch (Lofrans), three showers, dinghy with outboard engine, Spray Hood, Bimini Tent, Liferaft (12 pax), electric fridge, Roller Furling Genoa Quantum 2012 & Fully batented Main sail Quantum 2012, Radio CD player with interior and exterior speakers ,TV, DVD, complete safety & galley equipment, water heater, battery charger shore power, 6 winches, Autopilot, Inverter 12V-220V, library. ELECTRONICS: VHF, Speedolog, Depth Sounder, Wind Instrument, GPS Plotter Garmin, EPIRB, Meteo. COMMENTS: Excellent condition - Professionally maintained.